When you star looking for a vacation package online, discounts appears on the air, with free announments, high discounts, and some more, but what is behind those discounts? In many of the cases companies that offer such a great deals for Orlando Florida requires a curtesy meeting one of the days you visit the theme parks. This is a great strategy for different properties in Orlando that intead of spending money on TV advertisement of press the do they marketing people expending on the future guest of their property. People who value discounts and are open mind fit perfectly for these and should take advantega of this ticket promotion or vacation packages deals because finally there is not finantial commitment when you pruchase your vacation, that decision is responsability of the agents that take on a Resort Preview. Disney Epcot Food and International Festival will initiate its festival on August 31 and this year 2017 until november 13, this in an spectacular event to awake all your senses. Disney Epcot recognize for its world showcase honor this section with a taste with innovative cooking tecniques around the world. 35 kiosks will be present either representing a type or cusine or an ingredient. Around the festival the favorites of curse are the global marketplaces, eat and beat concert Series and must see events where your can participate at the preparations of world wide chefs. The Disney Epcot Food and Wine Festival is adding on the last event more upscale events where the expertise and knowledge are highly appreciate and exposed to the guest for an additional cost. Vacation packages are easy to get with an afordable price so you make a room on your package for the tasting at Disney Epcot. One day admission at Disney Epcot with 4 days and 3 nights hotel start at $169 with Orlando Discount Tickets USA deal. 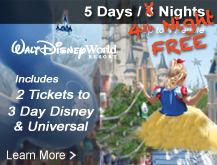 Visit www.orlandodiscountticketsusa.com to discover getaways to Orlando Florida and also multi day Disney tickets promotion. Walt Disney World Resorts announced the dates in which will be celebrationg the most family oriented Halloween Celebration. The Mickey Not So Scary Halloween Party this 2017 will have an early star on August. Orlando Discount Ticekts USA share with you the new dates so families can enjoy the Halloween Spirit and kids can celebrate with fears. Just finaling summer time of 2017 comes the great opportunity to celebrate special theme event at the Theme Parks in Orlando Florida. At Walt Disney World there are 2 great events at 2 great theme parks of Disney with 2 totally different perspectives of entertainment and celebration, these theme park are Magic Kingdom with Mickey’s not so Scary Halloween Party and Epcot with International Food and Wine Festival . Orlando Discount Tickets USA will pay attention today to the Magic Kingdom celebration of Halloween with useful insights for you to take the most of the event. Mickey Not So Scary Halloween Party is a perfect Trick-or-Treat for all family members starting on August 25th through November 1st, 2017. The celebration requires a separated admission besides the general admission to Magic Kingdom and the party always start at Magic Kingdom from 7:00 pm to Midnight from the following nights. Look for your discounted halloween vacation package at Orlando Discounts Tickets USA and discover how to save and enjoy with your family in a safe environment on your Halloween 2017. Every year at the Walt Disney Wolrd Theme Parks is expected to have new additions or events that enhance the tourist and locals that are always following the Disney Brand. Disney Magic Kingdom: Starting on May 14 a new and fresh show night show will be available at Cinderella Casttle. The mapping technology used for Disney will be applied with new projections combine with Disney storytelling. The new show is call “Happily Ever After Spectacular”and will include original animations of Ursula, Aladdin and Tiana. Disney Epcot: As a recieving event of 2017 between Jan 14 through Feb 20 was celebrated Epcot International festival of the Arts which a visual, performing and culinary event. Disney Animal Kingdom: for these theme park just few days ago was lauched ivers of Light which is a nightime show that celebrates the beauty f all living things using projections over wáter, dramatic light and special effects. Besides Rivers of Lights that was highly expected there is another attractin that will be ready on May 27, this is Pandora: The World of Avatar that will show diferente bioluminescent plants, impressive floating mountains and 2 attractions that will transport vsiitors to the famous movie Pandora. Disney Typhoon Lagoon: A raft family style attraction named Miss Adventure Falls openning n Spring 2017 where guest will slide down on a White wáter rafting adventure past the lost and glittering treasure of the fable Capain Mary Oceaneer. Disney Springs: The offer available for Disney Spring isa round the gastronomic tastes. On 2017 will be a total of 4 restaurants, the first one and now open Planet Hollywood comes back with a new look and new menú. Paddlefish also opened is the new versión of the Fulton’s Crab. For Spirng 2017 The Polite Pig will brimg Wood fired smooked and grilled ítemsand the last one that will open also during Spring is The Edison with food, cocktail, live entertaiment, cabaret and music. 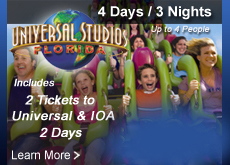 Now is the time to start planning your trip to Orlando Florida with discounted prices ofered by Orlando Discount Tickets USA. You can get an admission for 1 day in Disney for only $39 dollars per person by articipating in one of ur resort presentations or get vacation packages starting at $199 with acomodation for 4 days and 3 nights at the Radisson Orlando Celebration and admission for 2 people for 1 day in Disney. Start exploring www.orlandodiscounticketsusa.com vacation packages for yout trip on 2017 and have a great time with the new releases of walt Disney Wolrd.